Peoria is a major suburb in the northwest portion of the Phoenix Valley and the 9th largest city in Arizona. Being 179 square miles in area, Peoria stretches from Northern Avenue at the southern end all the way into Yavapai County to the north and also encompasses Lake Pleasant Regional Park. N 67th avenue divides Peoria in the east from Glendale. Sun City and Sun City West are west. 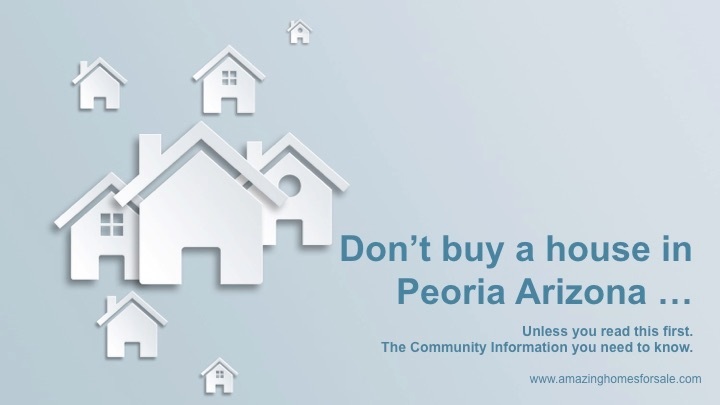 At The City of Peoria Official Website, you will find all the essential information about the Peoria. Peoria is family–friendly, home to great schools and parks with vibrant dining and shopping. Peoria's emphasis is on resort and leisure living. To find more information go to Visit Peoria Arizona. Peoria has lots to do during your leisure time. Here are links to very helpful websites. The Crazy Tourist and then also Trip Advisor. Peoria's economic plan focuses on establishing the new Loop 303 freeway corridor as an industrial, commercial, mixed development use. Great growth is forecast along this route both economic and residential. Residential development is concentrated in the North-West portion of the city, in Vistancia, Tierra Del Rio, and Pleasant Valley districts. The Phoenix grid system is the basis for the street system of Peoria where most roads are oriented either north-south or east-west. The origin point is in downtown Phoenix at Central Avenue and Washington Street. Since Peoria is always west of zero, its north-south numbered Streets are Avenues. Major streets are spaced one mile apart. One-mile blocks are divided into about 800 house numbers although this can vary. In northern Peoria, streets are more curvilinear and begin to deviate from the north-south route due to geographic challenges. Peoria Schools are mostly within Peoria Unified School District (PUSD) and Deer Valley Unified School District (DVUSD). High Schools in Peoria are Peoria, Centennial, Sunrise Mountain and Liberty. PUSD elementary schools within Peoria are Alta Loma, Apache, Cheyenne, Copperwood, Cotton Boll, Country Meadows, Coyote Hills, Desert Harbor, Frontier, Ira Murphy, Lake Pleasant, Oakwood, Oasis, Parkridge, Paseo Verde, Peoria, Santa Fe, Sky View, Sunset Heights, Sun Valley, Sundance, Vistancia and Zuni Hills. Though the city of Peoria has 23 PUSD elementary schools, some students fall within the boundaries of the other 10 PUSD elementary schools located inside the city of Glendale. Additional information of schools and their ranking can be found in these websites: Niche and Peoria Unified School District. With over 300 days of sunshine, give relocating to Peoria Arizona some consideration as so many other families have.